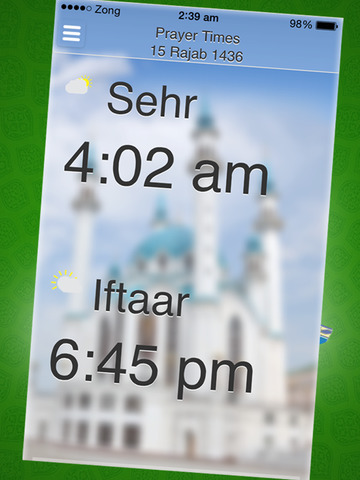 "Ramadan Calendar" is a supreme quality iPhone/iPad application, especially developed to be accompanied during this Holy Month of Ramadan. "Ramadan Calendar" is need of every Muslim in this Holy Month of Ramadan (رمضان). "Ramadan Calendar" is a very special gift to Muslim community on this Holy Month of Ramadan (رمضان). "Ramadan Calendar" reminds you about Sehr, Iftaar and Prayer timings and different Supplications/Prayers/Duas suggested by Prophet Muhammad (P.B.U.H.). It will keep on reminding you about all prayer time as well as sehr and iftaar according to your area during this Holy Ramadan. You can always check for Qibla (کعبہ) direction. 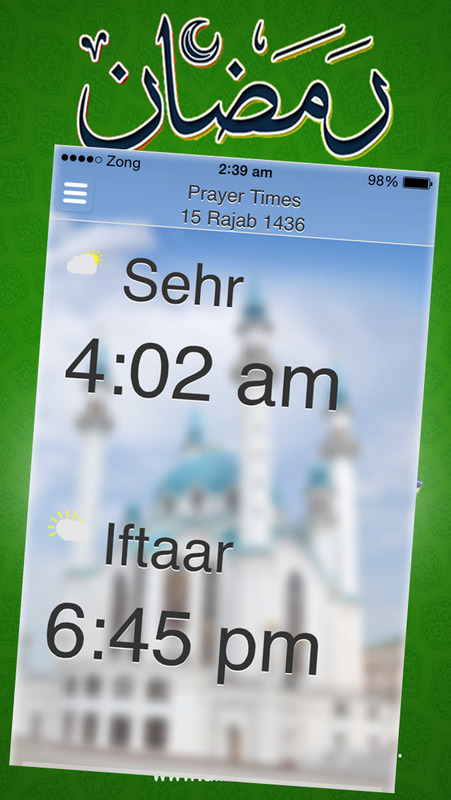 In short, this application is a nice tool to be accompanied with yourself during this Ramadan (رمضان). It will be alerting you on accurate Prayer timings in your area and will also remind you about all prayer (Salah/الصلوٰۃ/نماز) timings. 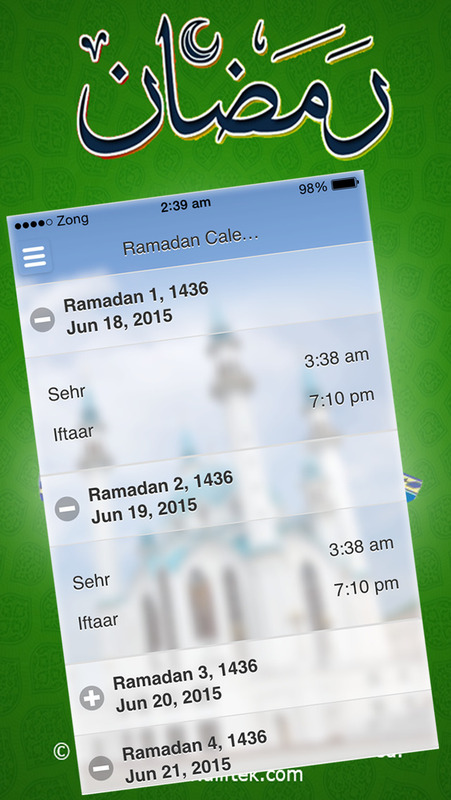 "Ramadan Calendar" comes with detailed calendar for Holy Ramadan for sehr and iftaar timings. It is also accompanied with various supplication/prayers/duas suggested by Prophet Muhammad (P.B.U.H). 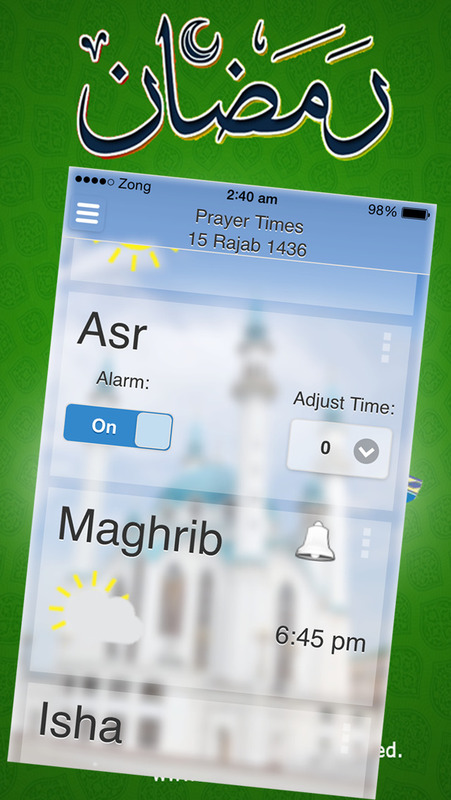 In short, this application comes with all great features to make this Ramadan (رمضان) full of blessings. -Prayer times according to all school of thoughts. -Adhan (Arabic: أَذَان) audio for Fajr and other prayers. -Custom audio selection for Prayer reminder. -Supplications/Prayers/Duas/Zikr before and after prayer according to Ahadiths. -Add multiple locations with GPS/Google Maps or Manually. Ramadan (Arabic: رمضان , Persian: Ramazan, Urdu: Ramzan; Turkish: Ramazan) is the ninth month of the Islamic calendar; Muslims worldwide observe this as a month of fasting. This annual observance is regarded as one of the Five Pillars of Islam. Holy month of Ramadan lasts 29–30 days based on the visual sightings of the crescent moon, according to numerous biographical accounts compiled in hadiths. The word Ramadan comes from the Arabic root ramida or ar-ramad, which means scorching heat or dryness. Fasting is fardh (obligatory) for adult Muslims during Ramadan, except those who are ill, travelling, pregnant, diabetic or going through menstrual bleeding. Muslims are always waiting for Holy Month of Ramadan (Arabic: رمضان), to spend their days and nights in worshipping Allah, reading Quran e Majeed ( قرآن ) and supplications/prayers/duas (اذکار), in order to get rewarded in this world and on the day of Judgment. Holy Ramadan (Arabic: رمضان) is the month when Allah chains the devil and rewards for good deeds is increased. Mosques are full of Muslims, and everyone is busy in praying to Allah and in supplications/prayers/duas ( اذکار ), to get more and more rewards. MyShelf HD - Note & Image Manager. Organize in color.